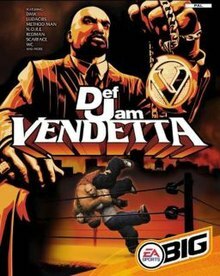 Def Jam Vendetta is a 2003 professional wrestling video game that combined hip hop with pro wrestling. It was released for the PlayStation 2 and GameCube under the EA Sports BIG label in North America and Europe, and the EA Games label in Japan. It was EA's first attempt at a wrestling game since the widely panned WCW Backstage Assault. Several hip hop artists were featured in the game, including DMX, Method Man, Redman, Ludacris, N.O.R.E., Capone, Scarface, Ghostface Killah, Keith Murray, WC, Joe Budden and DJ Funkmaster Flex; all of which at the time were artists of Def Jam. Singer Christina Milian was also featured in the game as Angel. A sequel, Def Jam: Fight for NY, was released on September 20, 2004 to largely positive reviews. The game features a largely unmodified AKI engine, used in the company's Virtual Pro Wrestling games and its spinoffs with some minor "button mashing" elements added and more of an arcade than a simulation. The game plays very similarly to WWF No Mercy, and features a lengthy story mode that allows you to level up and enhance one of four player characters in your quest to become the most well known star in the urban fighting league and fight the undefeated underground boss, D-Mob (voiced by actor Christopher Judge). Players can win in one of three ways; pin, submission or KO. Pins are done by pinning the opponent for 3 seconds before he can kick out. The player can trap opponents in holds that gradually weaken one of their body parts (head, body, legs and arms). This hold can be broken by touching the ropes. If one of those gauges reaches empty, the bones get broken and that player submits & automatically loses. Players can attack their opponent to build up a power gauge, letting them activate 'Blazin' mode. If the player successfully grabs an opponent in this state, he can perform a special move. If the opponent's health is low enough, they will be KO'd. The game features 46 playable characters, including real-life hip hop artists signed to Def Jam at the time, as well as original characters. Christina Milian appears as Angel Rodriguez, a non-playable character. Japanese rappers Dabo and S-Word appear exclusively in the game's Japanese release. The player has a choice between 4 street fighters: Briggs, a dishonorably discharged soldier; Proof, an ex-superbike racer; Tank, a massive japanese fighter, and the DJ Spider, although the story is the same for each of them. When the player chose their character they are called to help out your friend Manny by taking his place as a street fighter. Once The Protagonist win fights, they'll go against Scarface. Once The Protagonist beat him they'll get 1st first girlfriend, Deja. Other girls will come up to The Protagonist every few fights and they have to choose which one you prefer as your girlfriend and they'll fight each other. Eventually, N.O.R.E. will challenge The Protagonist to a fight at Grimeyville in LeFrak City, Queens, New York City, New York. Before the fight, The Protagonist arrive and almost get in a fight with D-Mob (Chris Judge). Not long after the fight, Manny signs The Protagonist and him up for a tag team tournament. After a while, The Protagonist will be challenged by Ludacris to a fight in Club Luda. After the fight, D-Mob claims that The Protagonist and Manny are nothing. He says that if anyone in the club wants the power and respect, they have to beat him at the Def Jam tournament. Manny tells The Protagonist to stop fighting, but he ignores him. DMX challenges The Protagonist but 1st the character has to overcome The Dragon House's offer. Once they have done that, they take on Method Man and Redman in the finale of the tag team tournament. After that, The Protagonist fights DMX. Once The Protagonist wins, they receive an e-mail from Angel (The Protagonist's girlfriend taken by D-Mob) saying that they need to talk. When they arrive at The Face Club, it is revealed that D-Mob has sent House, Pockets and Snowman to stop them from coming to the Def Jam tournament. The Protagonist defeats them, but Manny knocks him out and joins D-Mob against his will. Soon The Protagonist wakes up and enters the tournament and defeat their best fighters. D-Mob then attempts to shoot The Protagonist but Manny takes the bullet and survives. Your character triumphs over D-Mob and gets back Angel. While The Protagonist is walking out, D-Mob is arrested, leading up to the events of Def Jam: Fight for NY. By July 2006, the PlayStation 2 version of Def Jam Vendetta had sold 750,000 copies and earned $30 million in the United States. Next Generation ranked it as the 82nd highest-selling game launched for the PlayStation 2, Xbox or GameCube between January 2000 and July 2006 in that country. Combined sales of the Def Jam series reached 1.8 million units in the United States by July 2006. The response to the game was mainly positive, with fans citing the basic game play and presentation as superb, but many lamented the loss of key AKI features such as "gimmick matches" like the ladder match and the cage match, plus the lack of any true create-a-wrestler mode. The Cincinnati Enquirer gave it a score of all four stars and stated: "Electronic Arts deserves kudos for breathing new life into the aging fighting genre with this title's fresh approach." However, The Village Voice gave it a score of six out of ten and said, "If only DMX could sic his pit bulls on you, Funkmaster Flex burst your eardrums ID'ing himself, or Redman burn you with a blunt." Entertainment Weekly gave it a C+ and called it "an uninspired wrestling title that lacks Def Jam's trademark sheen." ^ Scott Alan Marriott. "Def Jam Vendetta (PS2) - Review". AllGame. Archived from the original on November 18, 2014. Retrieved November 18, 2014. ^ EGM Staff (April 2003). "Def Jam: Vendetta (PS2)". Electronic Gaming Monthly (165): 114. Archived from the original on April 6, 2004. Retrieved February 23, 2014. ^ Ronan Jennings (June 9, 2003). "Def Jam Vendetta Review (PS2)". Eurogamer. Retrieved February 23, 2014. ^ "Def Jam Vendetta (GC)". Game Informer (120): 88. April 2003. ^ Justin Leeper (April 2003). "Def Jam Vendetta (PS2)". Game Informer (120): 81. Archived from the original on November 21, 2008. Retrieved February 23, 2014. ^ The D-Pad Destroyer (April 1, 2003). "Def Jam Vendetta Review for GameCube on GamePro.com". GamePro. Archived from the original on March 9, 2005. Retrieved February 23, 2014. ^ The D-Pad Destroyer (April 1, 2003). "Def Jam Vendetta Review for PS2 on GamePro.com". GamePro. Archived from the original on February 12, 2005. Retrieved February 23, 2014. ^ a b Ben Silverman (March 4, 2003). "Def Jam Vendetta Review". Game Revolution. Retrieved February 23, 2014. ^ a b Alex Navarro (April 1, 2003). "Def Jam Vendetta Review". GameSpot. Retrieved February 23, 2014. ^ Matt Freeman (April 12, 2003). "GameSpy: Def Jam Vendetta (GCN)". GameSpy. ^ Matt Freeman (April 12, 2003). "GameSpy: Def Jam Vendetta (PS2)". GameSpy. ^ Carlos McElfish (April 15, 2003). "Def Jam VENDETTA - GC - Review". GameZone. Archived from the original on April 12, 2009. Retrieved February 22, 2014. ^ Natalie Romano (April 10, 2003). "Def Jam VENDETTA - PS2 - Review". GameZone. Archived from the original on October 6, 2008. Retrieved February 23, 2014. ^ a b Jon Robinson (March 31, 2003). "Def Jam Vendetta". IGN. Retrieved February 23, 2014. ^ "Def Jam Vendetta". Nintendo Power. 169: 137. June 2003. ^ "Def Jam: Vendetta". Official U.S. PlayStation Magazine: 86. April 2003. Archived from the original on April 6, 2004. Retrieved February 23, 2014. ^ a b c Marc Saltzman (April 15, 2003). "Virtual getaways await in 'Primal', 'Vendetta'". The Cincinnati Enquirer. Archived from the original on January 22, 2008. Retrieved February 22, 2014. ^ a b c Noah Robischon (March 21, 2003). "Rhythm & Bruise (Def Jam Vendetta Review)". Entertainment Weekly (701): 120. Retrieved February 23, 2014. ^ "Def Jam Vendetta Critic Reviews for GameCube". Metacritic. Retrieved February 23, 2014. ^ "Def Jam Vendetta Critic Reviews for PlayStation 2". Metacritic. Retrieved February 22, 2014. ^ Nick Catucci (March 25, 2003). "In Da Fight Club". The Village Voice. Retrieved February 23, 2014. This page was last edited on 6 April 2019, at 18:59 (UTC).